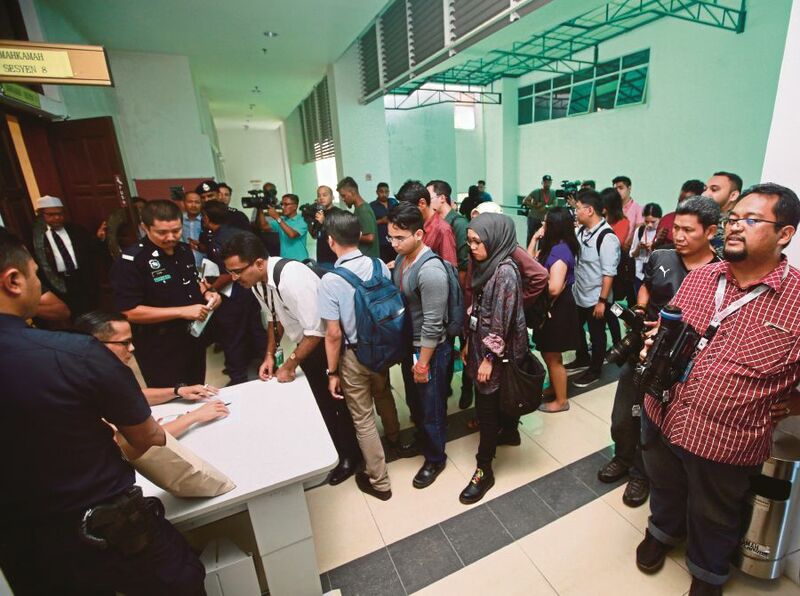 SHAH ALAM: It was an emotional hearing on the first day of the inquest into the death of fireman Muhammad Adib Mohd Kassim as his teammates unfolded the story on the day of the incident. Md Elliza Mohd Noor, who was the driver of the fire rescue truck (FRT), tried hard to hold back his tears as he was told to identify Adib in a photo in the witness dock. The 36-year-old Sarawakian described the incident as life threatening and terrifying as more than 50 rowdy people in a mob marched towards and attacked the convoy deployed to put out vehicle fires outside the Sri Maha Mariamman temple in Subang. “On Nov 27, we received a distress call at 1.01am and arrived at the scene about 10 minutes later with one FRT and EMRS (Emergency Medical Response Service) vehicle. “I was the driver for the FRT together with six of my comrades and we had two officers in the EMRS, Ahmad Shahril Othman as the driver and Adib as the medical response team. “As soon as we arrived, there were about 50 people who marched towards our vehicles and screamed ‘bomba jangan padam api ini’ (do not put out the fire). “Suddenly, I saw a man running towards my vehicle and slamming a white pole the size of a takraw net pole against our windshield,” he said when questioned by deputy public prosecutor Hamdan Hamzah. Elliza said several other hard objects including crash helmets and bricks were thrown at them, causing him to reverse his vehicle. He said his supervisor, whom he identified only as Badrul Hisham, told them to stay put in their vehicles. “I was so scared as I thought that the object could penetrate into our vehicle,” he said. Elliza said both the EMRS and FRT vehicles went to the police station at USJ 8 as soon as they managed to escape the incident, and only then did they realise that Adib was missing. “We tried to contact him (Adib) several times but he did not answer his handphone. About 15 to 20 minutes later, we received a call from the public that they were sending Adib to Subang Jaya Medical Centre (SJMC). “We rushed to SJMC in the FRT and stayed there until 5pm before heading back to our station to check for damages,” he said. Shahril, who testified later as the third witness, told the court that Adib was with him when the FRT hit the EMRS when it reversed. “I was still talking to him during the incident and said something about how one of our comrades known as Azim had acted swiftly in exiting the FRT in front of us to put out the fire,” he said. He said Adib was stunned when the FRT reversed into the vehicle, and held onto the dashboard. Earlier, the first witness, police Deputy Superintendent Mohamad Nasir Drahman, who was in charge of traffic control at the scene, said he saw the FRT ram into the EMRS vehicle when reversing. “The crowd started to swarm the FRT and throwing various hard objects, causing it to reverse and hit the EMRS vehicle which was parked behind it. “However, I did not see any firemen outside during the incident as there were too many people at the scene,” he said. Journalists and cameramen, many of whom had arrived as early as 8am, were jostling for position and anxiously waiting for the proceedings to begin. It was claimed that Adib, 24, died from severe injuries sustained after allegedly being assaulted by rioters at the Sri Maha Mariamman temple in Subang Jaya on Nov 27.